Speaking of time consuming projects, I have another one today! 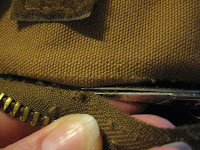 I need to replace the zipper in a Carhartt jacket that is pretty new. That means it is really stiff. The zipper is also a #10 brass zipper, which means its teeth like to bite my fingers as I try to rip it out! The jacket has been put together like Fort Knox, so getting the zipper out has been a real fight. If you ever buy one of these jackets and wonder about the price, you at least will know it has been extremely well made. 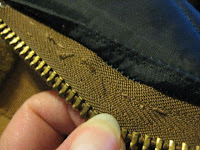 I ripped out the double row of top stitching, thinking this would release the zipper. I had to practically rip one stitch at a time and the thread is the same as the gold thread on a pair of jeans. I pick ALL of these threads out for the project to look its best. After literally hours of work, the zipper is still in there, sandwiched between the quilting and the outer fabric. 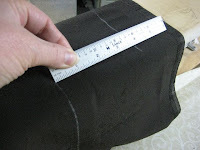 The final step, then, is to cut the zipper out, carefully cutting along the seam that joins the outer fabric and the lining. A couple of these pictures may illustrate this. 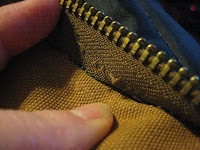 Usually on a jacket zipper, once the old one is out, there are two steps to putting the new one in. 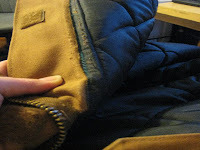 The first is to sew the zipper to the inner wind flap and/or lining. 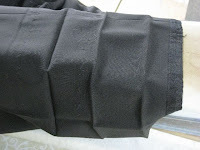 The second is to sew it to the outer fabric. Since the two layers are still attached to each other, I need to put the zipper between them and sew it all at once. This is not a sure thing, because that quilting fabric likes to sneak under the feed dogs and get caught. So, here goes, I'll be back tomorrow to let you know how it goes. Well, it's been such a long time since my last post. I'm getting things ready for my classes next month, so blogging has had to wait. Sorry for the delay. Today I shortened a pair of ladies' slacks that were cuffed. She had torn a hole in them and since they were too long anyway, she wanted to shorten them so the hole would be hidden. 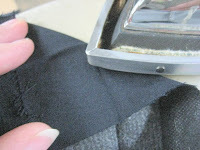 I shortened them an inch, putting the damaged fabric underneath, as part of the hem allowance. 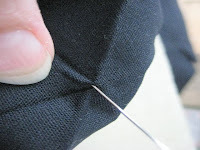 Start by taking out the existing hem and lightly pressing out the creases. The deepest crease closest to the crotch is your original hemline. 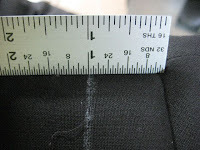 After marking one inch higher with tailor's chalk, I measured down onto the hem and marked 3¾". This is the hem allowance that will become the cuff. 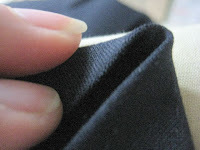 Cut off the excess, then serge or apply hem tape to the edge. I find it easiest to press along the newly marked hemline. 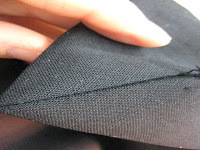 You have to think backwards, here, and fold the hem allowance UP toward the crotch, right sides together. 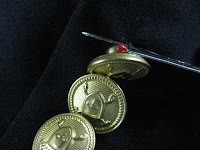 After pressing that into place, I fold it back in the other direction, so that the cuff of 1¼" is in place. The amount of fabric here is more than 1¼" though. 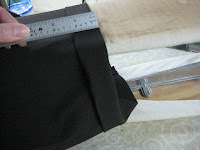 After it has been folded up on the hemline, then folded back down, there should be room for the 1¼" cuff plus ¾" to turn under to form the hem. 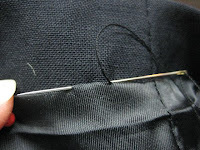 Stitch that with an invisible stitch. 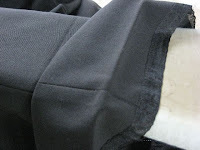 Then tack the cuffs at the side seams. I normally stitch in the ditch. This cuff ends up to be narrower than the 2" original, because I had to work around the hole. Normally, I replace the design features exactly as they were when I got the garment. Though it sounds complex, like anything else, it gets easier every time you do it.